Of all the great appetizer I picked up from Ruth-Anne Adams while working at Casablanca in Cambridge, this one is my favorite. 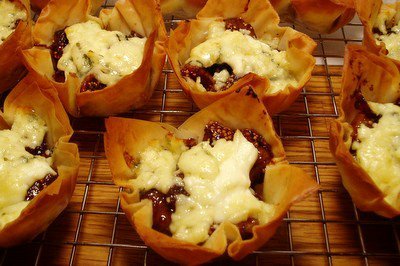 These little tartlets are great crowd pleasers and reheat beautifully if made in advance. What better way to welcome your guests to the holiday table than a combination of musky figs and creamy blue cheese! Serve them with a bold, fruity Shiraz as an hors-d'oeuvre or the first course. Set a heavy pot over medium-low heat. Add oil and shallots and cook stirring occasionally until shallots are tender and golden brown, 6-8 minutes. Add figs, lemon, rosemary, balsamic vinegar, honey, and wine. Cook on low stirring occasionally until the mixture thickens and turns deep brown, about 15 minutes. Take off heat and cool slightly. Figs can be prepared several days in advance and refrigerated. Preheat the oven to 400F. Set the racks in the middle and bottom-third positions. Spray muffin pan with cooking spray or brush with oil. Lay out 5 layers of fillo dough brushing with olive oil between each layer. Keep the rest of the fillo covered with a damp paper towel. Cut the dough into squares 4 inches on each side. Fit the squares into muffin cups and repeat to make a total of 18 tart shells. Fill each tart with 1 Tbsp fig filling and top with 1/2 tsp mascarpone and 2 tsp blue cheese. Bake tartlets in the middle of the oven for 8 minutes. Move to the bottom-third and bake another 4 minutes or until golden brown. Let the tarts cool for 5 minutes, remove to a serving platter, and serve hot. Tartlets can be made up to a day in advance, cooled, and refrigerated. To serve reheat at 375F for 8-10 minutes. Those look fantastic! I happen to have a big chunk of Great Hill Blue in my freezer (I know it's a crime to freeze it, but what can you do when someone gives you four pounds?) and now I know what I'm going to do with it. Now I just need an occasion. These do really look amazing! I am itching to make them myself. Helen, I just reviewed your shallot slicing video. Thank you! I am a fair cook and fairly competent, but no one has ever shown me how to cut an onion or a shallot! I feel enlightened. These tarts also look like something I may want to serve on Thanksgiving. Could I substitute goat's cheese for bleu. Not a fan of the veiny cheese!